It's a fruit. Supposedly Mark Twain's most favorite. I bought one yesterday to make some baby food and I am glad I did. It has a creamy texture and very light taste which is perfect for mixing with about any other fruit. They are ugly on the outside with a pretty pail whitish yellow flesh on the inside. The seeds are large and black so they are easily found and removed. 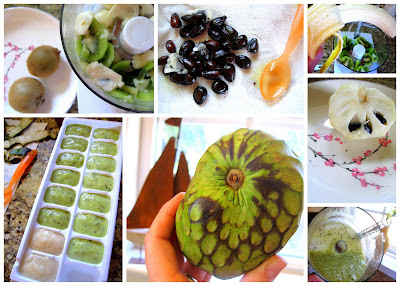 I made a small batch of plain cherimoya, a batch of kiwi cherimoya and a batch of banana kiwi. I made several batches of other types of foods yesterday, too. We have a market nearby that has an EXCELLENT selection of produce at very low prices. Many of their items are specialties in cultures other than my own, I guess. I almost bought these miniature eggplant called Indian Eggplant. They are the size of a golf ball but obviously egg-shaped. Cute! I will buy them when I find a good recipe for them. Raquel is doing fine. She is still her silly self but I bet you she really misses jumping on her bed and playing with the kids at school. Next week is Spring Break so she'll have a good amount of time to heal more before she goes back to school. I think I've heard of it before, but I never saw one. Interesting fruit. I once had a piece of fruit that was a hybrid. It was mango and avocado. WEIRD. Texture was like an avocado but the flavor was like a mango. SO STRANGE but good. That one is strange to me too. I would like to taste it. Ooh, I wanna try that hybrid fruit.